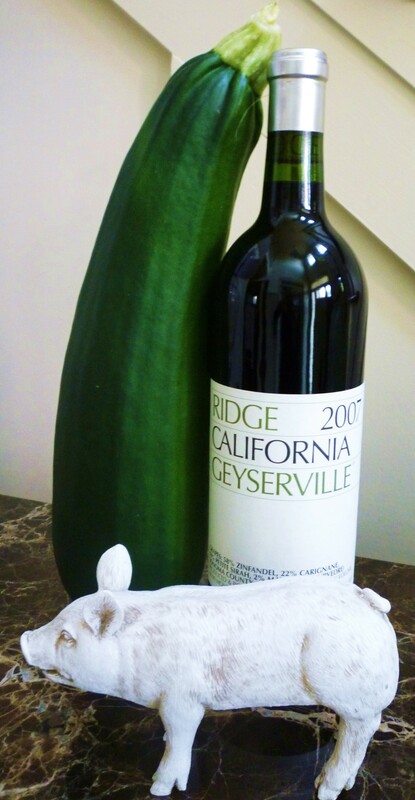 Well, the enormous zucchini I managed to miss in the garden will become zucchini bread tonight (recipe here). The bottle of red wine will be enjoyed during said domestic activity and after enjoying the wine and of course sampling copious amounts of fresh baked bread, I will surely feel like a pig. My night was not supposed to end like this. An ornery, disrespectful four-year old, necessitated a change in plans. So my plans got thrown out the window. I was designated parental prison warden for said naughty four year old, while the other half of our family is off enjoying a Gwinnett Braves ball game. So while the naughty lad lays tucked in bed, dreaming I’m sure of how to mess with what’s left of my psyche and sanity; I’m preparing to cook, drink, fold laundry and watch mindless TV. Sounds like my kind of night!